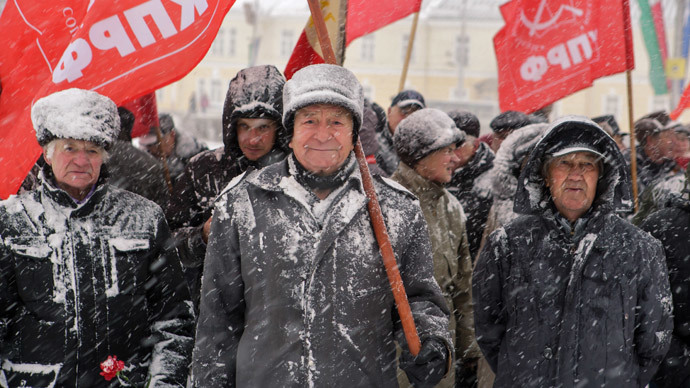 Russian Communist Party strongly opposed the plans to up the minimum at which citizens can apply for state pensions and said that such moves should first be tested on government ministers. The Russian Labor Ministry has repeatedly proposed increasing the retirement age from the current 55 years for women and 60 years for men to a universal 65 years. The move was dismissed when the economy was on the rise, but as Russia encountered a slowdown in the economy, the suggestion made it into the national anti-crisis plan, revealed in early 2015. This caused a wave of criticism from opposition politicians and mass media. On Tuesday, MP Valery Trapeznikov of the parliamentary majority United Russia party proposed a discussion of the increase of pension age only for certain categories of citizens, such as lawmakers themselves. Trapeznikov said this as Prime Minister Dmitry Medvedev was delivering his annual report on the state of national economy to the State Duma. Medvedev backed the move. However, the head of the Communist Party in the Duma, Ivan Melnikov, said that he would rather see the new approach tested on the government ministers. “We think that all ‘belt-tightening’ measures related to parliamentarians are normal, but we also think that it was a slip of the tongue on Medvedev’s part – when he wanted to start with ‘oneself’ he meant the government,” Interfax quoted Melnikov as saying. At the same time the lawmaker strongly opposed the raising of retirement age for ordinary citizens. “The Communist Party is against the increase of retirement age and if such move involving lawmakers and ministers is just a test of public response that would lead to the minimum retirement age of 65 years for all citizens we will not simply agree to this,” he said. Deputy Labor Minister Andrey Pudov attempted to relief the tensions saying that such steps would only be made after thorough research and as the last resort. Last week President Vladimir Putin mentioned the raising of the retirement age in his televised Q&A session. He also urged the officials to be extremely careful and only resort to such steps if absolutely necessary.